B&M #3713’s new headlight is front and center at the Project3713 table at the Amherst train show in West Springfield, MA. 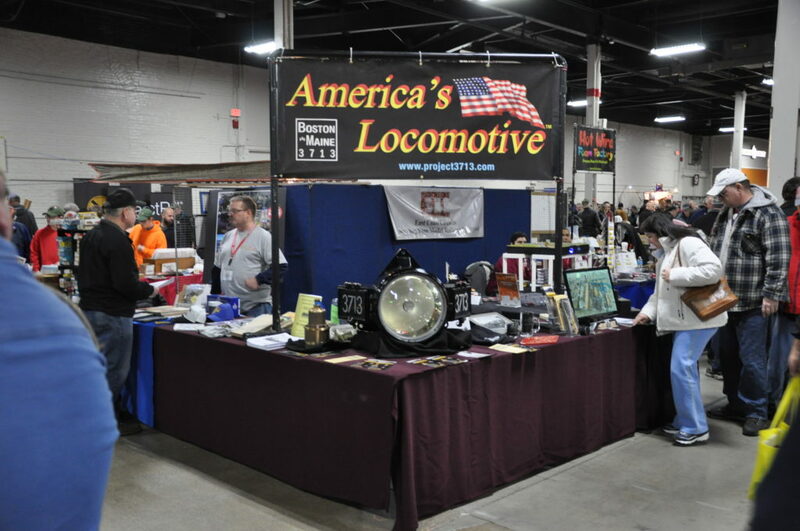 On Friday, January 25, Ed Fortuna and I drove to West Springfield, MA to represent Project3713 at the Amherst railroad show. We went directly to the Big E fairgrounds to unload my truck and set up our display tables. Early Saturday morning, after a quick breakfast at our hotel , we went back to the Big E and got ready for the 9am opening. When the horn sounded the crowd stormed into the Better Living Center building where our tables were. Having the 3713’s restored headlight along with a brand new safety valve on hand was a big draw to our tables. Thanks to Samantha Kuczynski we had a new DVD showing work in progress on the 3713. This also was a major draw for folks interested in the 3713. Of course many friends, former co-workers as well as 3713 fans stopped to talk and get updates on the progress. Many, in the course of a conversation, reached into their wallets and dropped some cash in the donation jar. The best news was that we were presented with a $500.00 Grant from the Mass Bay Railroad Enthusiasts, Inc. This grant will go towards the purchase of new sight glasses for the cab of 3713. Sunday the doors opened at 10am and the crowds were lighter but steady. Again it was a busy day for Ed and myself. When the show closed at 5pm we broke down our display and packed up my truck, gassed up and headed back to Pennsylvania. It was a long weekend but we enjoyed meeting all the people interested in the 3713.